Spikes, 10cm long, of soft yellow flowers. This widespread species occurs as a shrub in heath, coastal scrub, dry sclerophyll forest, grassy forest and subalpine forest. As a tree it is relatively common on sheltered coastal sand dunes and in the grassy woodlands of the Midlands. Place the seed in moist paper or sand and refrigerate for 6-10 weeks. Seeds will generally release from cone (tweezers may be necessary) once removed from tree and placed in warm room. Or use oven 80-100oC for 30 mins, with door partially open. Seed short-lived once extracted. Very useful for providing medium-level cover (up to 8m) in windbreaks. May be used as a sheltering species in timber belts. Resistant to wildlife browsing due to its unpalatability. 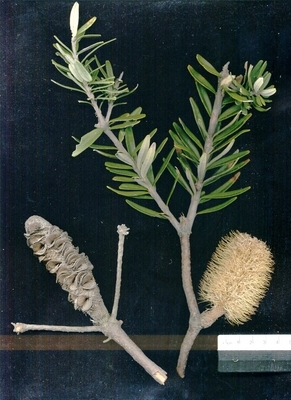 Susceptible to Phytophthora cinnamomi.Koori (mainland) use: Flower cones were soaked in water in wooden vessels to extract the sweet nectar to make drinks. The dry cones were used as strainers. Attracts native birds. Not suitable below powerlines. From cuttings of firm, young growth.